Like in 2012, we distinguish between matching systems that have participated in the ontology matching tracks and matching systems that have participated in the instance matching track. There were 6 ontology matching tracks: benchmark, anatomy, conference, multifarm, interactive matching evaluation (interactive), large Biomedical Ontologies (largebio), plus the instance Matching (im) and ontology alignment for query answering track (oa4qa). This year, only the query answering track is not run under SEALS, all the other are. Some systems had problems to generate results for some SEALS tracks, but this can also be counted as a result. Links to the pages describing the results for each track can be found at the bottom of the page. Overall, OAEI 2015 has 22 participants (this is an increase with respect to OAEI 2014 which had only 14 participants). 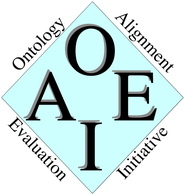 Nine of the systems participating in OAEI 2015 had participated in 2014 (AML, InsMT+, LogMap, LogMapC, LogMapLt, LogMap-Bio, RiMOM, RSDLWB, XMap). Table of participants.(•). Confidence stands for the type of result returned by a system: it is ticked when the confidence has been measured as a non boolean value. This year, apart from COMMAND and LYAM++, all systems were able to run under the SEALS platform. COMMAND experienced some issues with regard to the used of a library in conflict with the SEALS workflow, while LYAM++ could not be wrapped according to SEALS instructions due to license issues with BabelNet. The synthetic result paper is available here (cite it from the Ontology matching workshop proceedings). In case of further questions, directly contact the organizers of the specific track. Contact information can be found at the bottom of each linked results page.